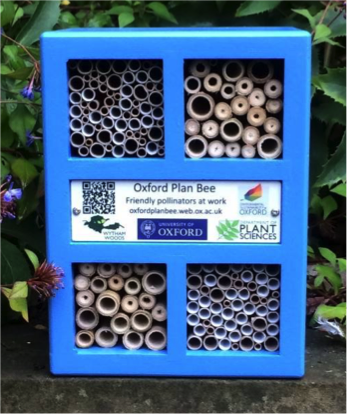 Oxford Plan Bee is an exciting new initiative to provide a window into the world of our city’s solitary bees. The project aims to create a network of bee hotels across the city of Oxford and in Wytham Woods (an area of ancient woodland just outside the city). These bee hotels will improve the value of the University and city infrastructure as habitat for cavity-nesting solitary bees. Cavity-nesting solitary bees do not live in big colonies, are excellent pollinators, and are harmless to humans, so they’re ideal for a space that is shared with people, such as gardens, courtyards, or any public area that includes flowering plants. The nest-boxes also offer a research opportunity. Not only is it possible to observe occupancy and species diversity year to year in the different habitats, it’s possible to collect bees and nest material from the hotels to analyse forage plant species (through pollen analysis) and to study the population genetics of the bees. Find out more about solitary bees and how to do your bit for them! Click here to find out more about solitary bees, click here to find out what you can do in your garden to provide bee habitat, and click here to send us your images and observations from the nest-boxes. Find out about another citizen science bee project, the Wytham Woods BeeWalk – click here! Oxford Plan Bee is an exciting new research initiative, due to be launched in Spring 2018. The project aims to provide long-term monitoring of the Oxford's solitary bees, by establishing a network of bee hotels across the university. This project is a shared initiative between the University of Oxford Department of Plant Sciences, the University of Oxford’s research woodland Wytham Woods, and the University of Oxford Sustainability Team and is informally linked to the Trinity College Dublin Campus Pollinator Plan.